A marriage of tradition and rustic fare. A garden fresh bouquet of fire roasted zucchini, yellow squash, red onions, bell peppers, and mushrooms; perfectly seasoned with garlic, oregano, and basil; accompanied by a rich blend of herb cheese and ricotta; and elegantly displayed in a mouth watering sundried tomato tart shell. Best if partially thawed under refrigeration then bake in a pre-heated 350ºF convection oven for 12-14 minutes or until done. Capturing the charisma of the French-inspired delicacy, Kabobs’ Tuscan Ratatouille Tart transports dining patrons to a rustic country garden with flavors of fresh zucchini, red and yellow peppers, yellow squash, red onions, mushrooms, garlic, basil and oregano. 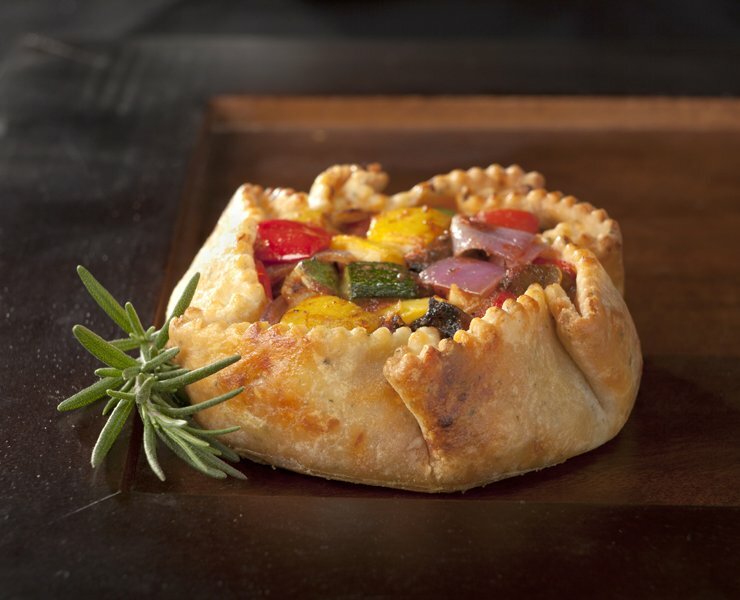 Placed in an sundried tomato, herb tart, with creamy herb cheese, the Tuscan Ratatouille Tart adds vibrant color, robust flavor, as a plated vegetarian appetizer or entrée. Fresh, hand cut vegetables. Vibrant color. A creamy fontina and sundried tomato blend enveloped in a moist chicken breast strip and coated with an herb seasoned breading. Roasted Portobello mushrooms, artichokes, zucchini, Spanish onions, red peppers, and Kalamata olives are hand rolled in a sheet of pasta with a mixture of ricotta and parmesan cheese. A miniature version of the iconic Windy City classic, beef frankfurter topped with a colorful array of dill and sweet relish, slice of red bell pepper, yellow mustard, and diced onions on a classic bun.